IN LIGHT OF THE PRESENT CRISIS in the church, our Christian duty to pray for our priests assumes a greater importance today than in any time in history. As such, Our Lady has instructed Veronica to hold a Holy Hour of reparation every Sunday for the intention of the Holy Father and the fallen hierarchy in the church, as well as to atone for the profanation of the day of the Lord. The requested hour of reparation has faithfully been kept since its initiation in 1970, as the faithful gather at the sacred grounds each and every Sunday between the hours of10:30 a.m. and noon to offer the 15 decade Rosary, a litany, and to sing devotional hymns to Our Lady. 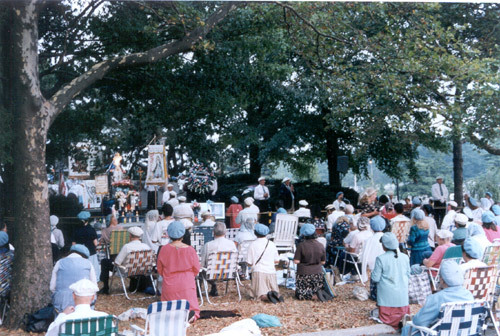 (The original time given by Our Lady was 1 p.m. to 2 p.m. but was changed when we moved in 1975 from the original site of St. Robert Bellarmine Church to our present open-air site. For nearly 50 years, the Sunday Holy Hour has stood as a pillar of dedication to the cause of the sacred priesthood--a dedication which, to our knowledge, can not be found anywhere else in the world today. 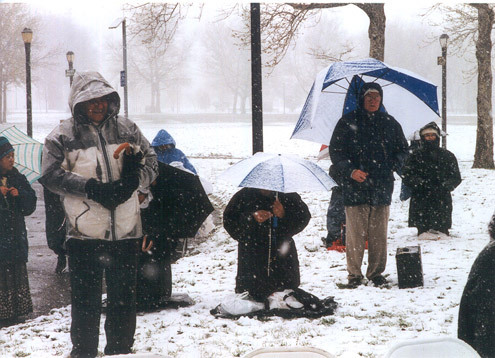 For it is here on these sacred grounds that those of true faith are praying with true charity and purpose, bearing the harshest, elements that nature can dish out so that priests everywhere might be given that grace and fortitude to rise above the world and remain true to their vows as representatives of God. The weather can be brutal in New York, and during the course of a year the pilgrims will endure a, whole spectrum of climatic conditions from a humid 99'F, to a wind chill of -20'F, to a driving rain or snow. will endure a, whole spectrum of climatic conditions from a humid 99'F, to a wind chill of -20'F, to a driving rain or snow. It has truly been said, that our priests will only be as holy as we pray them to be. Our Lady Herself has said that the clergy do not have a special passport to Heaven (Wisdom 6:5,6), but must merit their way to the kingdom by carrying their cross and remaining ever true to their vocation. We urge you to begin your own Sunday Holy Hour (call your local organizer) and, if possible, to unite yours with ours because it is far more efficacious. St. Louis de Montfort in 77th Secret of the Rosary states: "Somebody who says his Rosary alone only gains the merit of one Rosary, but if he says it together with thirty other people he gains the merit of thirty Rosaries. This is the law of public prayer. . . . It is very easy [for Satan] to break a single stick, but if you join it to others to make a bundle it cannot be broken." Consider that you would be gaining the merit, on the average, of 150 rosaries. Plus, the added benefit stated by Our Lady (see excerpt above). This preeminent Marian Saint adds: "Public prayer is far more powerful than private prayer to appease the anger of God and call down His Mercy, and Holy Mother Church, guided by the Holy Ghost, has always advocated public prayer in times of public tragedy and suffering." May the Bayside Holy Hour serve as a model and incentive for all concerned Catholics today, that they, too, will pray and take up their defense for the priesthood which is now being attacked with a ferocity that only Lucifer and his agents could contrive. 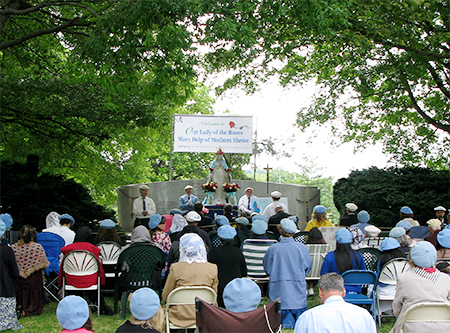 This beautiful story of grace, peace and redemption opened publicly on June 18, 1970 when the Mother of God visited Veronica Lueken on the grounds of the old St. Robert Bellarmine Church in Bayside, New York and later at the Vatican Pavilion site (blessed by Pope Paul VI) in Flushing Meadows Park, New York. Beginning in 1968, St. Theresa the Little Flower prepared Veronica for these Heavenly apparitions. For 25 years, the Virgin Mary and Her Divine Son would appear to this mother of five children during Rosary Vigils on these sacred grounds until her passing in 1995. Our Lady asked that this Shrine be called �Our Lady of the Roses, Mary Help of Mothers� and that a Sunday Holy Hour offered for the Pope and priests be held. Over 300 comprehensive messages packed with wisdom and guidance for these latter days were transmitted through this seer named by Heaven, Veronica of the Cross. Our Lady of the Roses Shrine is under the stewardship of the lay Order of St. Michael (est. 1977), a vibrant community of dedicated, celibate men who have been appointed by Heaven to lead this global mission. Our Lady has prophesied that this lay Order will bring forth the full-fledged religious Order of St. Michael, an order founded on tradition, which will also include a cloistered convent. Our Lady has also stated that curative waters will erupt and a magnificent basilica will be erected at the original site of St. Robert�s. The Vigils and Holy Hours continue to this day at the Vatican Pavilion inspired by Our Lord�s promise: �We have made Our home upon these grounds.� Cures and conversions abound and for countless pilgrims, faith and hope have been restored. We invite you to join us.